Every strong personal relationship requires patience and compromise. Remodeling your home requires the same positive attitude. The best relationships grow out of challenges that are faced as a team. The best remodeling results come from a team effort. Get your team prepared for the challenge of remodeling by seeking good advice and it will be a wonderful design journey. When you’re ready, we hope you’ll check out kitchenviews.com to get the professional help to guide you through your design journey. Small kitchens work best when the space is streamlined down to the essentials for efficiency. Essential items used everyday – pots, pans, dishes, glassware, etc. You will want these within easy reach. Occasionally used items – party platters, punch bowl, etc. You can plan to store these in harder to reach cabinets, or even move them to a storage area somewhere else in the house. Items with sentimental value – your grandmother’s mixing bowl reminds you of times you cooked together, but you never use it now. Maybe a display cabinet can be included in the new design to showcase such items. Never used items – whatever these may be they are taking up valuable space. Let them go. If the item is in good condition and someone else could use it, donate it to a local thrift store. If it’s broken and you kept meaning to get it repaired, just throw it away. If it’s been broken and taking up space for a long time then you don’t really need it. Make a list of new items that you believe you must have in the redesigned kitchen. Writing them down can help you to evaluate whether they are essential or wish items. Essential items will need an easily accessed place designed to hold them. Wish items may turn out to be only used occasionally. You will have to evaluate whether they need to be in the kitchen, or if possibly a work area just needs to be available for various tasks. For example, baking – you may want special baking equipment and a work area for this activity. But does this task happen often (weekly) or occasionally (for holidays)? Figuring out how the kitchen design will work in real life is the most important part in any design, but especially with smaller spaces, the placement of everything is extremely vital. 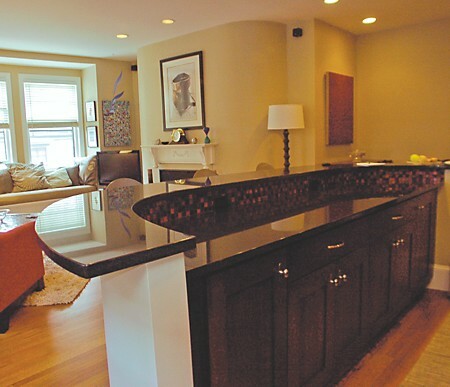 Below is a fine example of a small galley kitchen designed by Kitchen Views. But what you cannot see in the photo is how items are organized for use. Once you’ve sorted your kitchen items, think about how you use the kitchen. Walk through a task such as preparing a meal and make note of your movements plus how many times you return to a particular appliance or the sink. What items do you use for the task, you want those items to be near your work area. 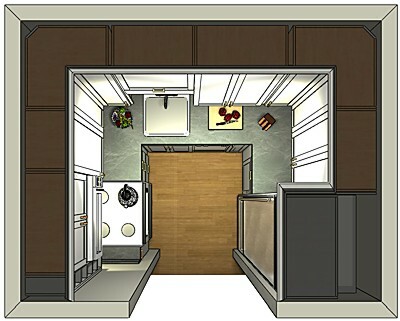 That will help you to visualize the changes that will make things easier in the redesigned kitchen. For example, perhaps you start at the refrigerator to get ingredients, then prepare them at the counter. Are knives and other prep tools handy? Do you frequently need to rinse vegetables in the sink? Maybe you reach for a pan next and put in the ingredients. Is there counter space near the stove? Are spices handy? Use this method for other tasks such as serving meals, doing dishes, and so on. Take note of how you perform these various tasks, and then you’ll have a good idea what you need in your kitchen remodel when you go to work with a designer. 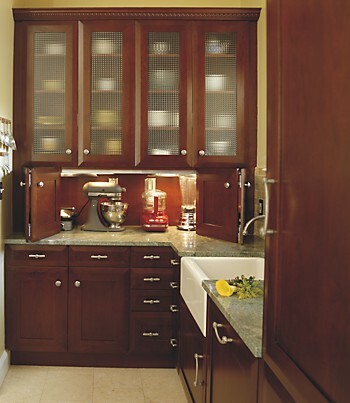 Be sure to check back often as we continue our “Small Kitchen Design That Work” series. As always, if you have any good ideas or design solutions that you know work, feel free to leave a comment and share them with us. Next in the series: Match the style to be an extension of the rest of your home. No matter the size of your kitchen, if you’re looking to remodel, there’s plenty you can do even with a small space. Certainly, there are many times in which homeowners will completely knock down a wall to open up their kitchen space to the rest of the living area. 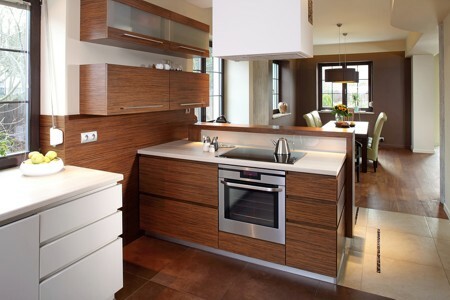 There is quite a trend towards having the kitchen be the most central room of the home both socially and functionally. However, this is simply not the case in every living situation. Small kitchens, in fact, can prove to be most efficient and the limiting space can actually lead to a great deal of inspiration design-wise. Furniture quality, plus all the conveniences. A perfect example is this small kitchen in a condominium. Because this kitchen is also seen from the adjoining living space, the owner wanted the cabinetry to look like furniture more than like kitchen cabinetry. The cabinet door in the foreground at right is actually concealing the refrigerator. 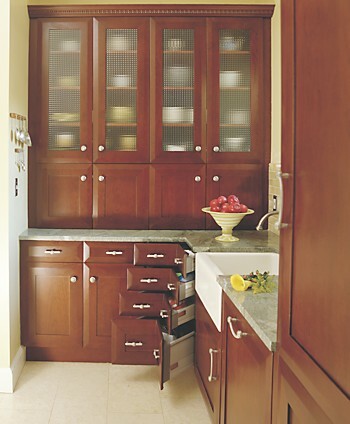 Corner drawers provide convenience and maximize the use of available space. In order to get the most function storage space and usable counter space in this small kitchen, the designer used special corner drawers and a specially designed storage section for small appliances. Custom designed folding doors reveal convenient placement of small appliances. Everything is easily at hand for use, the counter space provides plenty of prep areas, and it all stores away behind beautiful cabinetry fronts. 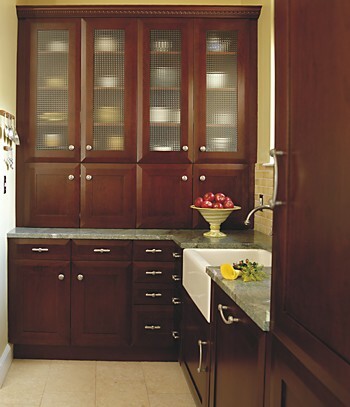 We’ll be offering more small kitchen design ideas on our blog in the near future. If you have a small kitchen, and would like to offer your ideas for a redesign of your small kitchen space, please feel free to leave a comment and share them with us. We’d love to hear from you.